Many social workers find themselves in management positions within a few years of graduating from MSW programs. Most of these jobs are in nonprofit human service organizations in which, increasingly, business acumen is necessary to maintain grants and donations, start new programs, market services to clients, supervise the finance function, and understand the external environment. This book teaches MSW students and early-stage social work management practitioners the essential business skills needed to manage programs and organizations; to improve their overall management toolkit for finding a better job or getting promoted; and, ultimately, to gain parity with other managers holding MBA degrees and working in the human service space. This text can serve as a desk reference for managers to troubleshoot various situations. It is also appropriate for social work macro practice courses at the undergraduate and graduate levels, as well as courses that cover human resource management and financial management. Too many social work students leave our programs without learning basic skills in business. Essential Business Skills for Social Work Managers addresses this significant curricula gap. In addition, Germak's unique background as an educator and practitioner delivers this content in an engaging textbook that students will enjoy. I am thrilled to use this text in many of my macro courses! Essential Business Skills for Social Work Managers fills an important niche in social work literature and education - especially for those who aspire to lead and manage social service organizations - by clearly explicating business knowledge and skills that are essential for organizational success in today’s highly competitive and rapidly changing environment. Using a combination of practice examples, illustrative figures and suggested learning exercises, this groundbreaking book brings into focus the essential business skills social workers need to manage social service agencies successfully. This book is destined to be a classic, as well as an essential resource for social work faculty, students, and managers. Germak provides a clear description of social entrepreneurship and its benefits, bringing together goals of social change and the use of business strategies to help get there. This is a valuable approach for improving community functioning and strengthening the work of social service agencies. Both the clear descriptions in the content of the book and the useful learning exercises bring concepts to life, ready to be used. Germak helps the reader to see the many places this work can be done and the knowledge and skills can be used. It is refreshing to see a book on social work management that so clearly and effectively brings out the business side of this work in a way that firmly connects with the ethics and intentions of social work. Social work is a business and business skills are imperative for social workers to excel and become future leaders. Yet unfortunately many social workers leave school without this knowledge or a business mindset. Essential Business Skills for Social Work Managers fulfills this gap in social work education and is a guide every social worker can use to navigate this sometimes unfamiliar, yet necessary territory. 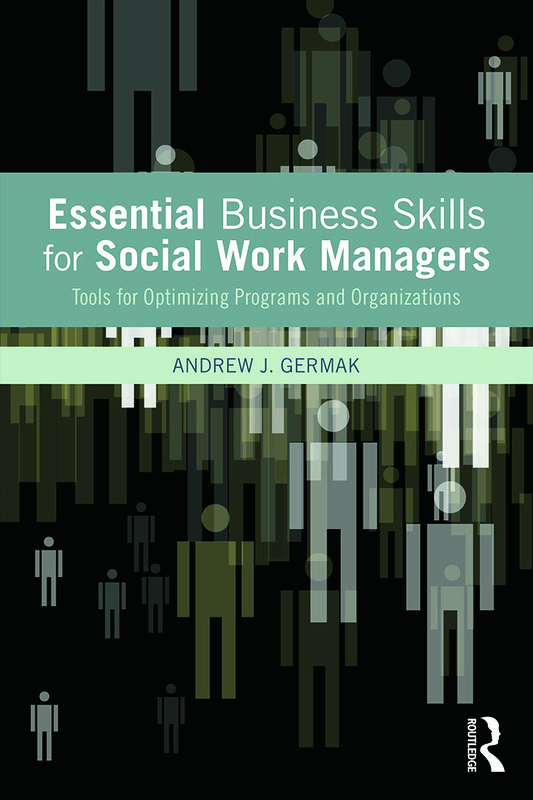 I loved Germak's personal stories and anecdotes, which made it easy to understand how to apply business principles to social work. I recommend social work leaders everywhere to take advantage of this invaluable resource. Germak wrote this inspiring book based on his life stories, first-hand experience and creative thinking as a successful senior leader of American NGOs. To build the essential business sense and skills for non-profit organizations is not only important for making a sustainable organization, but also significant for producing greater social impact. This book is also a perfect guide-book for Chinese non-profit sector which is developing rapidly. I would be more than happy to introduce this book, as well as the wonderful author, to China. Andy Germak, MBA, MSW, is executive director of the Center for Leadership and Management and professor of professional practice at the School of Social Work at Rutgers, the State University of New Jersey. His prior appointment at Rutgers was executive director of the Institute for Families, where he served for over three years. Previously, Germak served as president and CEO of the Mental Health Association of Morris County, Inc., and also held a variety of leadership and direct service positions in the nonprofit human service sector. He has authored editorial columns and letters appearing in leading publications, such as The Wall Street Journal and Financial Times. His 2010 academic article, "Social Entrepreneurship: Changing the Way Social Workers Do Business," has been widely influential. Germak received his MBA from NYU Stern School of Business, MSW from the Silberman School of Social Work at Hunter College in New York, and his BA in Psychology from the University of Michigan at Ann Arbor.